Lighthouses harbor mystery and charm from days gone by. 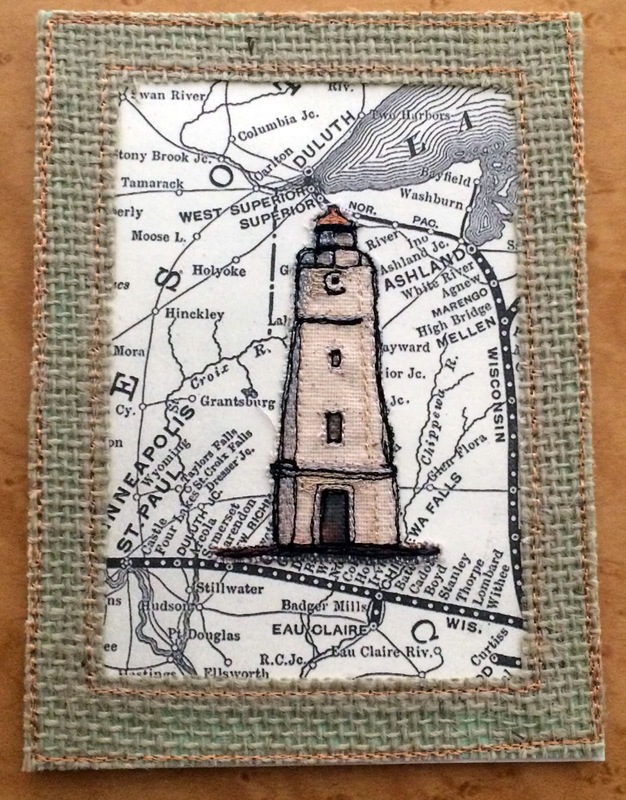 I selected lighthouses located near the person for whom the card was designed. All these lighthouses have stories to tell about the interesting and often brave people who operated the lights and of the lives they saved. For Wendy, Ashland Breakwater lighthouse was depicted by stitching only the lighthouse on stabilized cotton fabric. 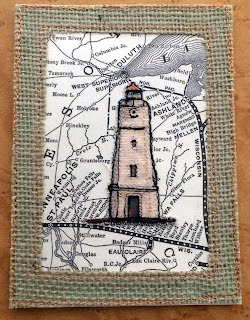 The stitched lighthouse was cut out and stitched to paper printed with a period map of the area where the lighthouse is located. 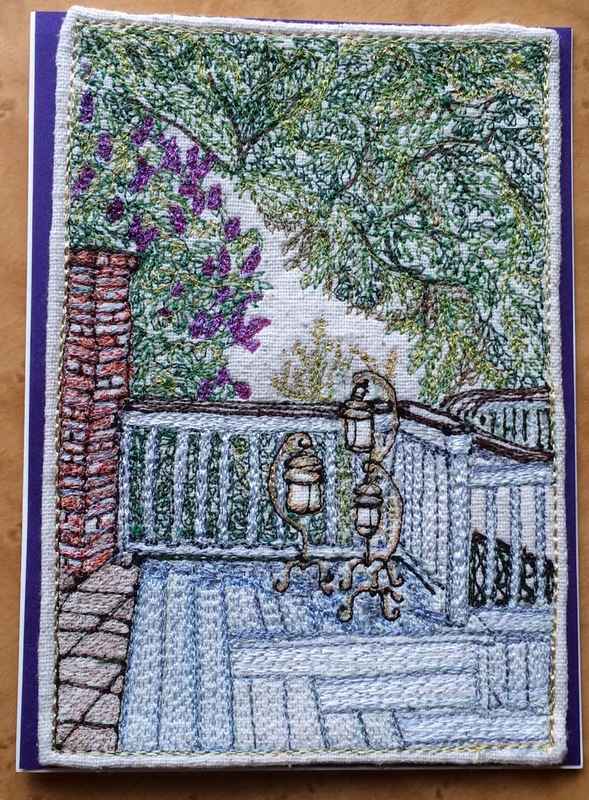 A burlap frame was added to complete the card. The Ashland Breakwater lighthouse is located in Chequamegon Bay near Ashland Wisconsin. It was completed in 1915 and automated in 1962. In 2015, Ashland Breakwater lighthouse was the ninth lighthouse to be included in the Apostle Islands National Lakeshore. 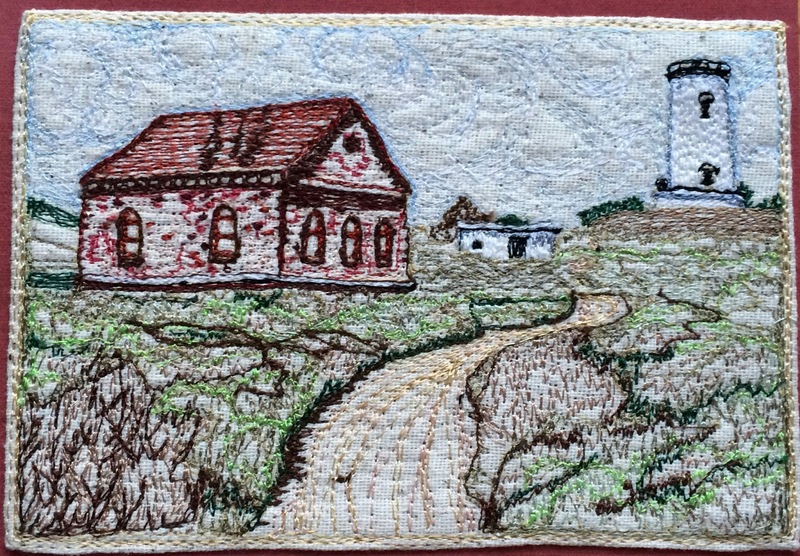 For Roy's birthday, I selected Sand Island light, also in Wisconsin. Extra stabilizer was used to protect the "stitch-rich" brick from puckering the fabric. 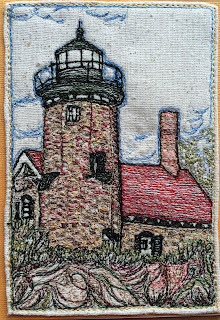 Because there was so much detail in the building itself, I chose to simplify the shrubbery around the lighthouse. Sand Island Light, located on the northern tip of Sand Island, Lake Superior, Wisconsin, was first lit on September 25, 1881. It was built from sandstone quarried at the building site. The light was automated in 1921. Today, Sand Island Light is part of the Apostle Islands National Lakeshore and is listed on the National Register of Historic Places. 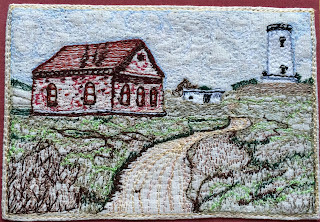 The card stitched for Jerry is inspired by a photo of the Piedras Blancas Light Station. 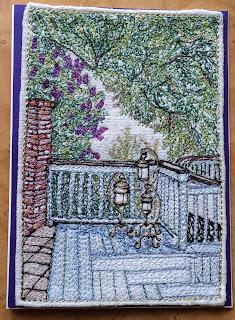 It was a challenge depicting the diverse ground cover without over-stitching, The result was less structured than planned. However, in the end, I was happy with how the loosely defined shrubbery worked with the more structured lines of the road and buildings. Piedras Blancas Light Station is located near San Simeon, California. It became operational in 1875. Through the years, earthquakes damaged the structure of the lighthouse. In 1949, the upper 30 feet of the lighthouse was removed. The tower and some of the support buildings are listed on the National Register of Historic Places. There is an ongoing effort to raise money to restore the tower to its original height. This card for Kristi was inspired by a photo taken on her deck in 2011. The fabric was heavily stabilized to accommodate the dense stitching. To finish the edges, the fabric was first wrapped to the back and stitched in place. I did not care for the look. Blocking and pressing did not improve the look, so I trimmed and frayed the fabric to within 1/4" of the stitching. Anyone who knows Shawna understands why her card is included in Shining Lights. Photoshop Elements was used to remove some of the color in the photo. I was careful to maintain the color in her face and hair. The resulting image was copied to stabilized cotton. 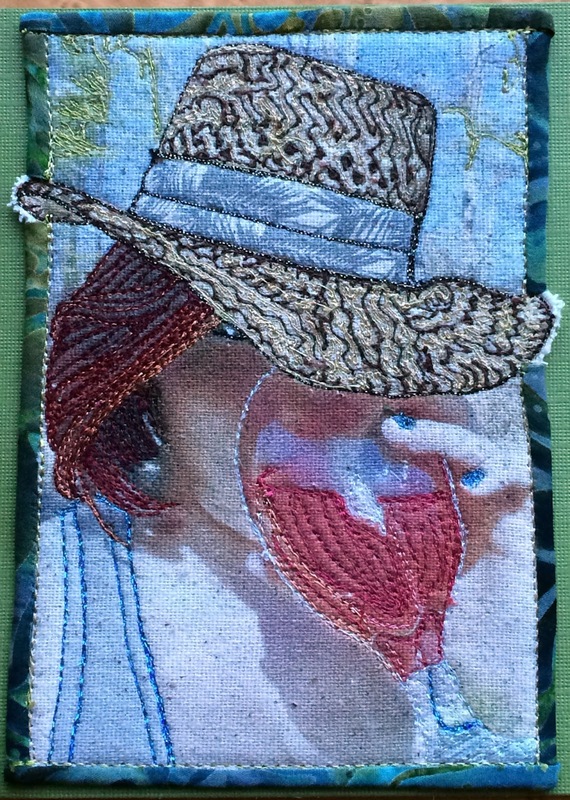 Most of the stitching is in her hat and hair. 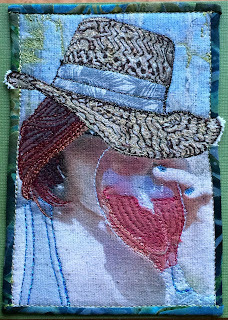 The drink, her nails and background were lightly stitched. A coordinating fabric was used to bind the completed thread sketch before adhering it to card stock. Christmas projects are nearly done. Boxes, wrapping paper, and ribbon clutter my sewing room. 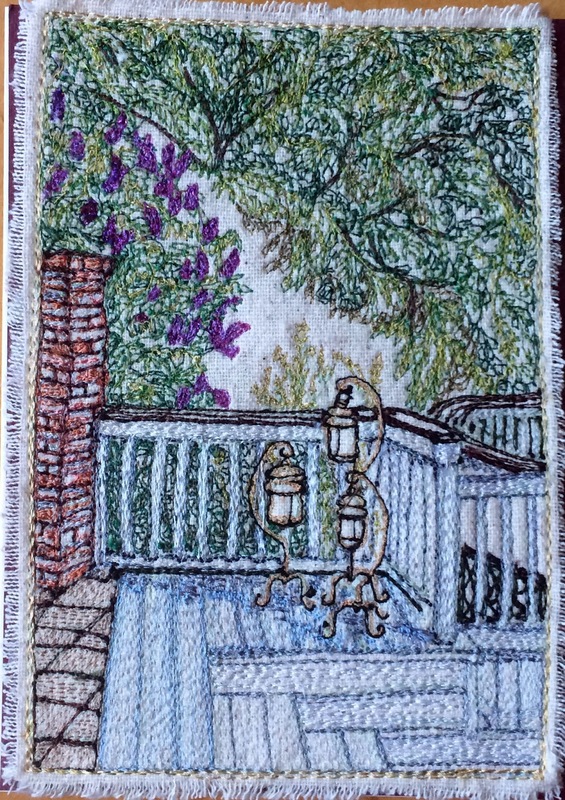 Although I enjoyed sewing for Christmas, I have several thread sketches in mind and anxious to get started. Please come visit again in January 2016! Happy Holidays!